emulsified oils of wild oregano, bay leaf, sage, and clove in a sea salt base. 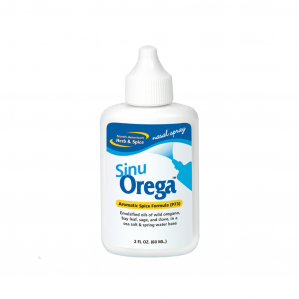 Sinu-Orega - is a natural nasal wash powered by potent spice extracts. These powerful extracts are combined with pure sea salt in a spring water base, the ideal wash and inhalant for the nasal membranes and sinuses. Fungi and mold spores are alive in our environment. They flourish in the air we breathe because of spring rains and the subsequent moisture that settles. They enter our bodies through nasal passages and then thrive upon the sugarin our diet. Consequently, it is very important to not only keep our environment free of the things that allow mold and fun gi to flourish, but also our bodies. Unfortunatley, these environmental factors can render some defenseless against sinus infection. Sinusitis is very prevalent in the American population and has been found to affect up to 37 million people, which is nearly 1 in every 7 Americans. Almost 70 percent of sinus infection sufferers are prescribed antibiotics, which may not only be ineffective but also may lead to antibiotic resistance. Many health practitioners agree that the use of a saline solution to slush out the nasal passages is the best approach. Flushing of the nasal passages has been found to work more effectively than merely spraying a mist of saline solution into the nasal passages. SinuOrega is the superior choice to aid the cleansing process of the nasal membranes. Combined with the powerful, wild-crafted essential oils of Oregano P73, sage, bay leaf, and clove, the pure sea salt in springwater base acts as a powerful saline wash. SinuOrega is a truly natural nasal spray, free of all chemicals and additives. Directions: Insert nozzle next to inner nasal membrane and gently squirt, immediately sniff contents deeply to distribute throughout the sinuses. Repeat with each nostril. For best results sniff deeply. Repeat as needed. Temporary burning, stinging, sneezing, or increased nasal discharge may occur. Non-addictive. Ingredients: Wild oils of oregano, bay leaf, sage, clove bud oil, sea salt, and spring water.